If you meet these requirements, please complete our online membership form by clicking the image below OR download a paper version of the Membership Form and mail it in along with your membership dues. Instructions for mailing are listed below. The annual membership fee is only $20. Please make checks payable to BAMC Auxiliary or pay below via PayPal. Click here and choose "save as" to save the membership application to your computer. Please complete the form (both pages) and mail it with your payment to the address listed below. 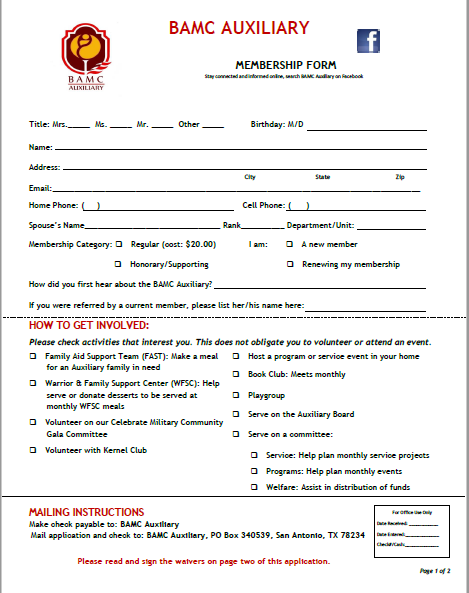 Please make checks payable to BAMC Auxiliary.